There's nothing quite like this season finale we've all come to love! Come experience the amazing Wild West Motorsports Park in Reno, NV. Join us as we celebrate our 2017 season and drivers! Drivers and 1 co-driver will receive free entry into the park. Additional entry fees for teams are $25 for general admission on site and USAC Pit Passes will be an additional $5. Until October 16th, teams can pre-order tickets for $20/ticket by clicking here and using promo code crew17. This will save you close to $10 at the gate! Please be ready to supply team member names when purchasing online. Click here for info on booking your rooms. Move in/registration will be Thursday, October 19th. Practice/Qualifying is Friday, October 20th. Race day and the Banquet are on Saturday, October 21st. 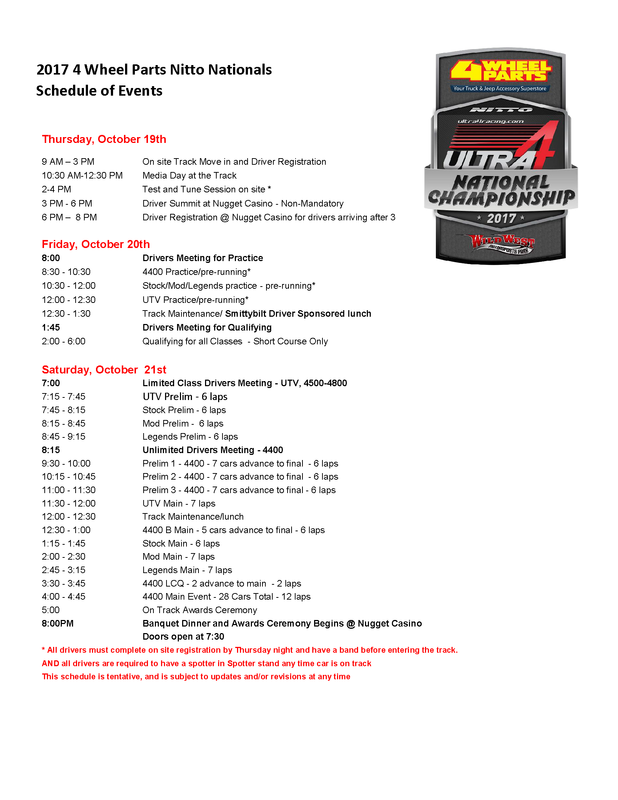 All drivers must be registered by Thursday Night for an early driver's meeting on Friday. Drivers that have special circumstances must let us know in advance, otherwise they will be subject to a $100 late fee for registering on Friday. The ULTRA4 Banquet will be held at the Nugget Casino following the race on October 21st. The Nugget offers more opportunities for teams to hang out before and after the banquet. Last year more than 600 drivers and team members attended! The banquet is open to any fans and teams that would like to attend. We will be celebrating our Nitto Tire National Champion, Western Regional Champions and our Spidertrax Eastern Regional Champions at the banquet. Nitto Tire has committed to buying dinner for every registered driver and co-driver. We will be doing a buffet style dinner to allow for more variety and flexibility of head count. The Banquet is open to friends and family who purchase banquet tickets. Please note: tickets must be purchased to be in attendance as we will be charged a dinner for every person there. Cost for adults is $60 and for kids is $35. Click here to purchase your banquet tickets - the drop down menu has a children ticket option as well. Each team will be given one 20x80 pit spot with dry camping, and parking passes for one RV/Trailer and 2 support vehicles provided they fit in the pit space. If additional camping space is needed, additional dry camping is available at $50 per RV. Along the south side of the parking area, Wild West has designated to be a dry general event camping area. This camping allows you to enter the park on Thursday and stay through Sunday (must be out by noon on Sunday) and does not include entry to the park. 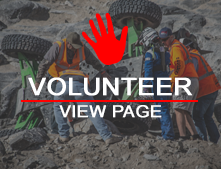 Ultra4 Nationals at Wild West Motorsport Park is your final chance to cheer on your favorite drivers before they take on the 2018 King of the Hammers. Tickets are available at this link! With ample grandstand seating, a number of food and drink vendors, and some of our biggest and best sponsors on hand, Nationals 2017 will be one for the books! Don't miss it! Full Schedule of events available here. VIP Packages @ Wild West Motorsports - Sold out! All individual and VIP booths are sold out for this year's event! The 4th Annual Nitto National Championship will be held next month in Reno at the Wild West Motorsports Park. Fans call it "King of The Hammers in a Short Course" and if you haven't seen it in person, you don't want to miss it! More than 100 drivers are expected to compete in the series finale and more than 600 ULTRA4 team members and their families are expected to attend the popular awards banquet. Check out all the drivers by clicking the "who's registered" tab. The Nugget will again be host hotel again for the banquet ULTRA4 teams and fans! Move in/registration will be Thursday. Practice/Qualifying is Friday. Racing and Banquet on Saturday. A more detailed schedule of events will be coming soon. All drivers must be registered on Thursday Night for early driver's meeting on Friday. Drivers that have special circumstances must let us know in advance, otherwise they will be subject to a $100 late fee for registering on Friday.